Below are common attributes associated to Gold Mound Spirea. Become a care taker for Gold Mound Spirea! Below are member comments regarding how to plant Gold Mound Spirea. No comments have been posted regarding how to plant Gold Mound Spirea. Be the first! Do you know how to plant Gold Mound Spirea? Below are member comments regarding how to prune Gold Mound Spirea. No comments have been posted regarding how to prune Gold Mound Spirea. Be the first! Do you know how to prune Gold Mound Spirea? Below are member comments regarding how to fertilize Gold Mound Spirea. No comments have been posted regarding how to fertilize Gold Mound Spirea. Be the first! Do you know how to fertlize and water Gold Mound Spirea? Below are member comments regarding how to deal with Gold Mound Spirea's pests and problems. No comments have been posted regarding how to deal with Gold Mound Spirea's pests and problems. Be the first! Do you know how to deal with pests and problems with Gold Mound Spirea? Looking for Gold Mound Spirea? Get Gold Mound Spirea fresh and large directly from the grower to your garden! 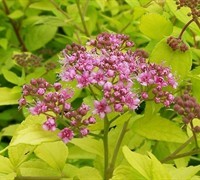 Buy Gold Mound Spirea online from the nursery wholesalers and save BIG! Plant Gold Mound Spirea in a location that provides very well-drained soil and full, all day sunshine. I prune my Gold Mound Spirea about half way back in late winter, before new growth starts to emerge. Then, after the first flush of flowers have faded in summer I usually shear off the faded flowers to encourage a new flush of foliage and flower growth. I fertilize Gold Mound Spirea lightly one time a year with a well-balanced, slow-release shrub & tree type fertilizer. I've seen no insect, pest or disease problems with Gold Mound Spirea. Well drained soil is a must as consistently wet soil can lead to root rot and other diseases.